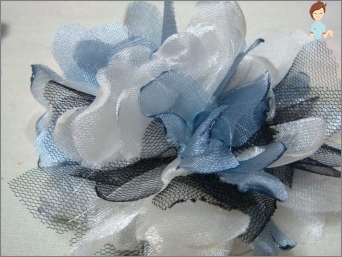 Flowers made of fabric, an excellent accessory,Which you can use to decorate your own hairstyle, summer dress, lambrequin. Elegant bouquet in the room, even in winter cold, will create a unique warm atmosphere. Moreover, it is not difficult to make an elegant decoration. Use for this you can make stuff. Having decided to perform a flower from a fabric, it is better to stock up all the necessary tools, as well as materials in advance, so that nothing distracts from the creative process. Semolina, colored in different colors, will be required to create pollen on filamentous stamens. Having prepared all the materials, you can proceedCreative process. First, it's better to try your hand at creating a simple accessory. If the work is to your liking, soon the house will be decorated with wonderful bouquets. 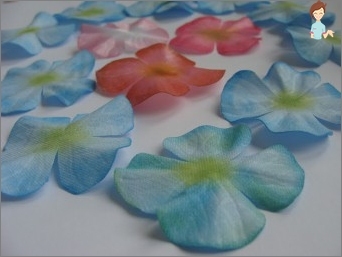 To produce a simple flower, you will need to make a circular pattern for the petals from the paper. Thread tightly tighten and tied, thus collecting all the petals in one "Bundle". The central part of the flower can be decorated with beads. 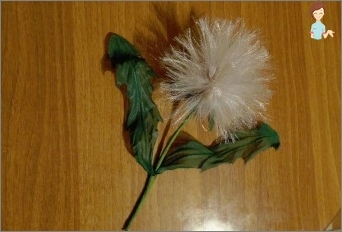 Having mastered the simple work, you can proceed to fabricate a flower from a fabric that is almost impossible to distinguish from the present, for example, a dandelion. Step 1. Artificial yellow silk is moistened with PVA. When the material completely dries, a strip is cut, about 2-2.5 cm thick. Over the entire length of the strip, cuts are made with the minimum possible step, leaving under the base no more than 0.5 cm. Step 2. The end of the aluminum wire is tightly wound with paper and begin to gently twist the base of the strips on it, not forgetting to coat the layers with glue. Care should be taken to ensure that the edge of the strip does not move. Step 3. If the finished corolla seems too small, you can prepare and wind another strip of tissue. Under the corolla base around the wire, a small piece of cotton wool is wound, forming a flower cup. Step 4. You can impregnate cotton wool with glue and paint in green. You can gently cover with a green cloth. To do this, cut out a circular piece with a notched edge. In the central part of the circle a hole is cut through which the tissue is passed to the base of the flower. The cup is smeared with glue and firmly pressed against the base of the bud. Step 5. From a thin tissue of green color, cut out the leaves on the template, which are pasted with a toned-up lepton on the wrong side. Wire tightly wrapped in a thin stripe of paper, painted in a suitable color. The leaves are glued to the stem. After collecting a few dandelions, they can be placed in a small basket, placing a little summer sun in your room. Extremely elegant is the lily made from fameirana. This material is used specifically for creating flowers. In texture, it resembles porous rubber. Step 1. Make a pattern similar to the lily petal. 6 blanks are cut from the fabric. Each petal must be heated by applying to the surface of a hot iron or blowing a hot air jet from the hair dryer. After heat treatment, the material will become much more pliable. Step 2. The heated petal is made as much as possible similar to the natural one by conducting a knife along the central part of the workpiece and creating a deep veinlet. From the base spend less visible streaks to the edges of the petal. Step 3. You can not be afraid to spoil the workpiece, because the foiuran is the material with which professionals create colors. When it is heated again, the fabric will return to its original shape, so you can correct minor defects. Step 4. Next, the petal needs to be pulled out and stretched its edges so that they become wavy. For better stretching, the petal can be reheated. Step 5. Each petal with a back side is glued to a thin wire. Then the petals are covered with oil or acrylic paint, seeking similarity to the original. The basis of the blanks is painted in green, the central part is pink. Also in the middle part of the petal, you can draw a few small specks, characteristic of the lily. Step 6. Of the threads pasted with paste, and the mangro make stamens. The ends of the threads after drying are simply dipped in the glue, and then in the mango. Ready "Pollen"Color in a yellow tone. Step 7. Collect the flower, trying to evenly distribute the petals and place in the middle of the stamen. Elegant flower made of fabric, madeAlone, will be an excellent gift for a loved one or yourself, beloved. The main thing is not to stop at what has been achieved, constantly improving the craftsmanship and coming up with new, exotic options for jewelry.